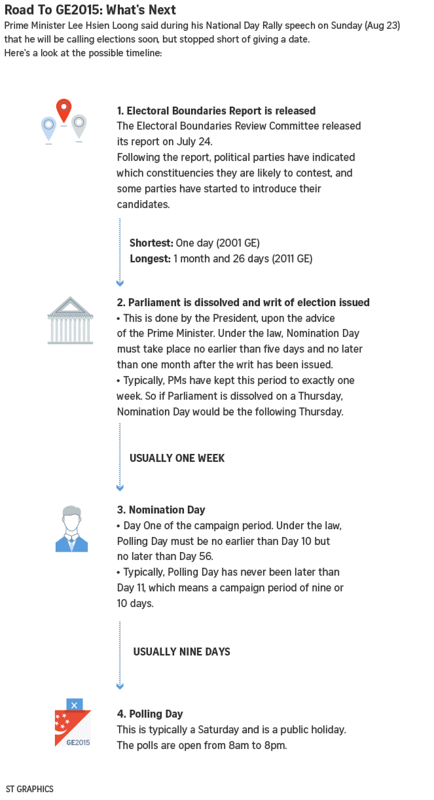 SINGAPORE - A general election will be called "soon", said Prime Minister Lee Hsien Loong on Sunday, but stopped short of mentioning a date. "Soon, I will be calling elections, to ask for your mandate to take Singapore into our next phase," he said at his National Day Rally speech. Singapore, he said, is at a turning point, having just completed 50 successful years and starting on its next 50 years of nationhood. The coming GE will be critical, he said. "You will be deciding who governs Singapore for the next five years; but more than that, you will be choosing the team that will work with you for the next 15 to 20 years. You will be setting the direction for Singapore's next 50 years. You will be determining the future of Singapore." Of the future, he asked if Singapore will become an ordinary country with intractable problems, slow or negative growth, overspending and a gridlocked government unable to act. Or, he said, will it "stay special" by being a multi-racial society strengthened by diversity and not splintered by divisions, a rugged society where everyone strives to do his best and looks out for their fellow men, and a people who live up to the song One People, One Nation, One Singapore? "If you are proud of what we have achieved together and if you support what we are going to do, the future that we are building, please support me and my team," he said. "Because my team and I cannot achieve anything just by ourselves. We have to do it with you, in order to do a good job for you. "So that together, we can keep Singapore special for many years to come." PM Lee said nobody could be sure that Singapore will still be doing well come SG100. "Nobody can promise that we will all live happily ever after. We all have our hopes and fears, our guesses and views." Earlier in his speech, he spoke of how Singapore's challenges seemed insurmountable 50 years ago, but the pioneers "dug their heels in and built a nation together". Fifty years on, the challenges are still formidable but far from insurmountable, he said. "Those people who feel daunted and think Singapore's best days are behind us - they are wrong," he said. "Our best days will always be ahead of us provided we continue to have a strong team of lions and the lion-hearted, leaders and people." He said the country has had such a good team so far, starting with the late Mr Lee Kuan Yew, his colleagues and the pioneer generation, who handed over to Mr Goh Chok Tong and the second generation of Singaporeans 25 years ago. Reflecting on the past 10 years, PM Lee said that the Government has built on what it had inherited and kept Singapore special. It has also delivered results such as more affordable housing and healthcare, stronger safety nets through programmes such as Workfare and Silver Support, and more pathways for children to reach their potential. "In the last 10 years, we built on what we inherited, we put brick on brick, climbed step by step, kept Singapore special, delivered results for Singaporeans." This was achieved because the late Mr Lee and his team planned beyond their terms and lifetimes, he said. They had also also nurtured the next generation of leaders and next generation of Singaporeans, and taught their successors to do the same. PM Lee said he and his team have also sought to do this for the last 10 years. "We have served you to the best of our ability. You have got to know us well. We have walked this SG50 journey together," he said. "My team and I take very seriously our responsibility to make sure Singapore lasts beyond us," he said. But, he added, his core team is already in their late 50s and early 60s and "we will not be around forever". He said it must have the next team ready in the wings, and while the "nucleus" of the team is there, "we need to reinforce them, to round out the team. That is what I will do at the next election".